University of Hawaii Press, 9780824830441, 324pp. Princess Bernice Pauahi Bishop was the largest landowner and richest woman in the Hawaiian kingdom. 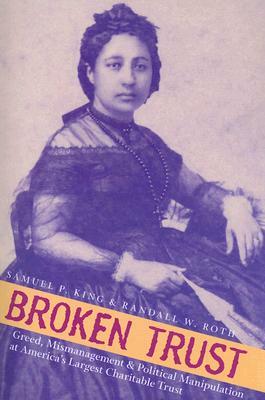 Upon her death in 1884, she entrusted her property--known as Bishop Estate--to five trustees in order to create and maintain an institution that would benefit the children of Hawai'i: Kamehameha Schools. A century later, Bishop Estate controlled nearly one out of every nine acres in the state, a concentration of private land ownership rarely seen anywhere in the world. Then in August 1997 the unthinkable happened: Four revered kupuna (native Hawaiian elders) and a professor of trust-law publicly charged Bishop Estate trustees with gross incompetence and massive trust abuse. Entitled Broken Trust, the statement provided devastating details of rigged appointments, violated trusts, cynical manipulation of the trust's beneficiaries, and the shameful involvement of many of Hawai'i's powerful. No one is better qualified to examine the events and personalities surrounding the scandal than two of the original Broken Trust authors. Their comprehensive account together with historical background, brings to light information that has never before been made public, including accounts of secret meetings and communications involving Supreme Court justices.